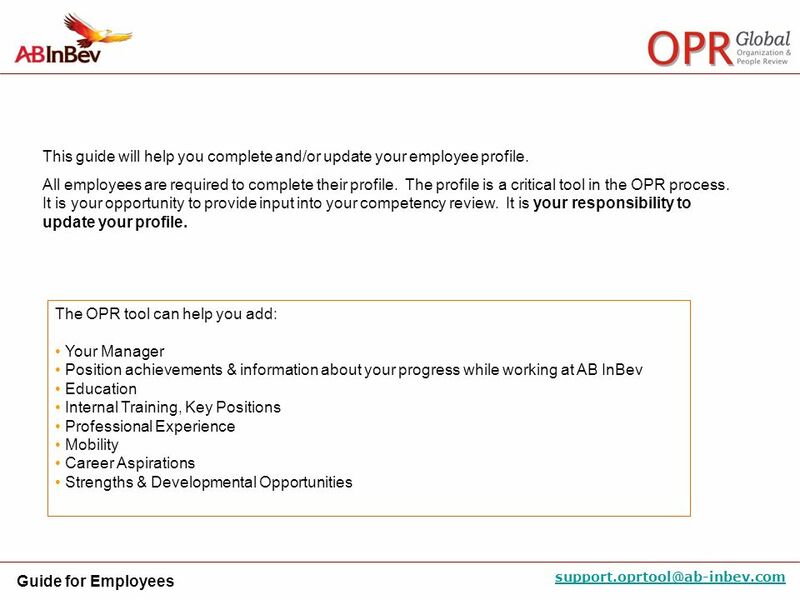 2 This guide will help you complete and/or update your employee profile. 6 Remember to click Save when you are done! 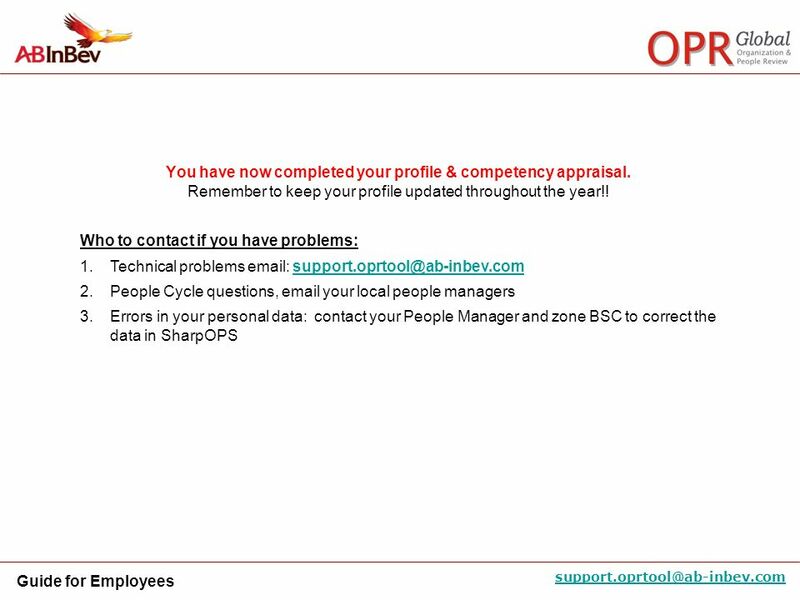 Updating your Profile Check that your information is correct (name, current location, position, etc). This information is pulled from SHARP and not be updated directly in the system. 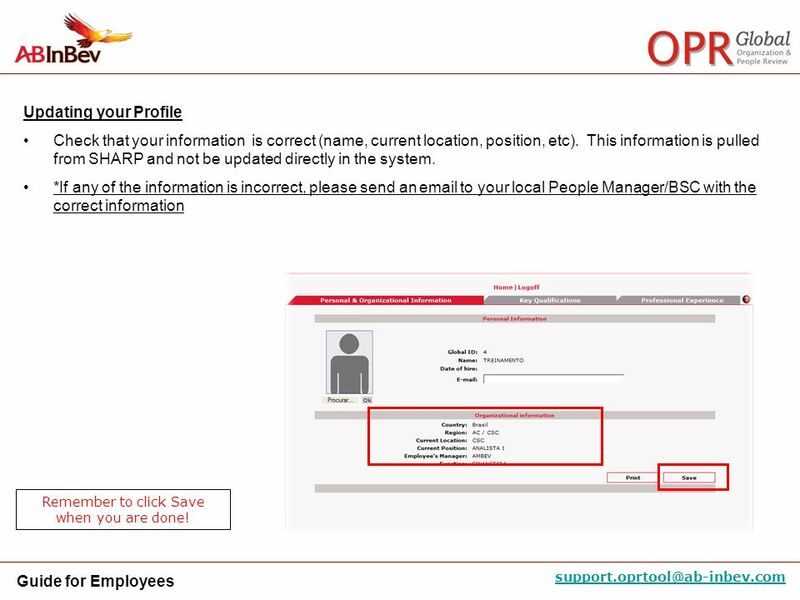 *If any of the information is incorrect, please send an to your local People Manager/BSC with the correct information Remember to click Save when you are done! 7 Remember to click Save when you are done! Updating your Picture Make sure that you have a picture uploaded. To add/change your picture, click on the “browse” button, attach the picture and click “OK” (pictures can be 500kb max). 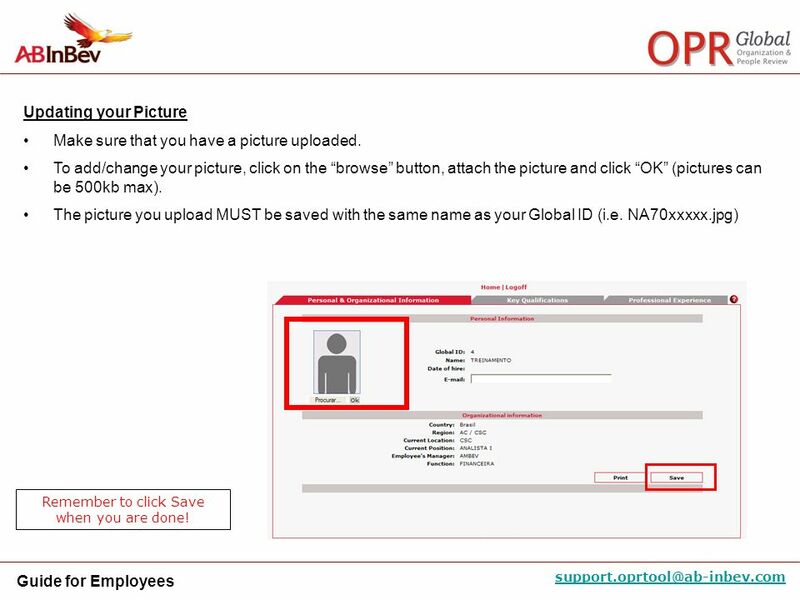 The picture you upload MUST be saved with the same name as your Global ID (i.e. NA70xxxxx.jpg) Remember to click Save when you are done! 8 Remember to click Save when you are done! 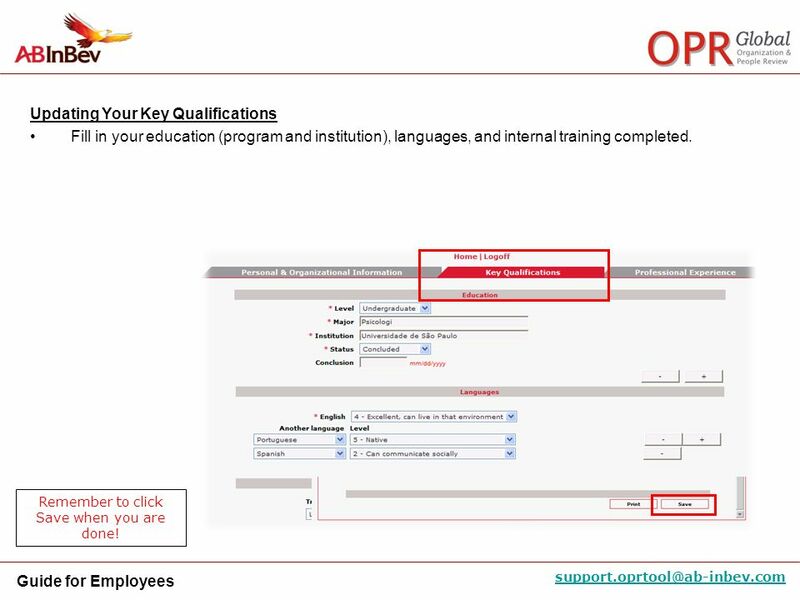 Updating Your Key Qualifications Fill in your education (program and institution), languages, and internal training completed. Remember to click Save when you are done! 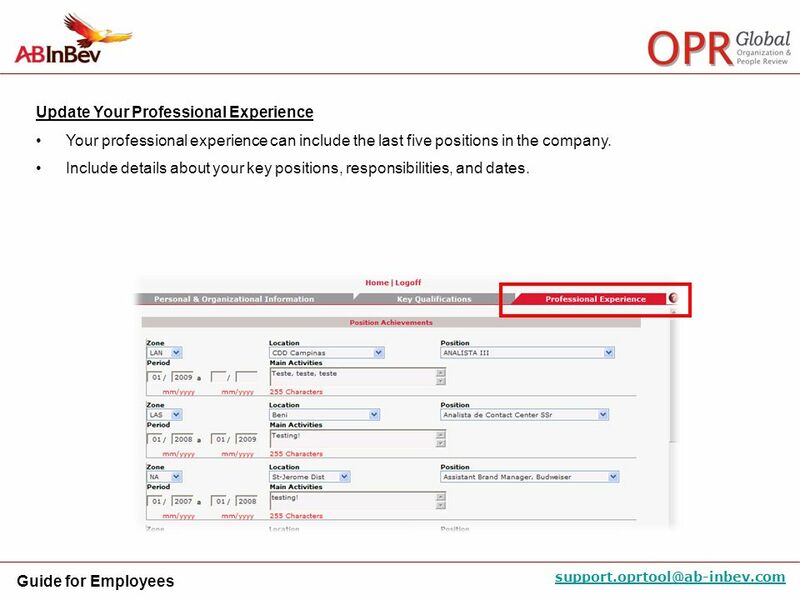 Your professional experience can include the last five positions in the company. 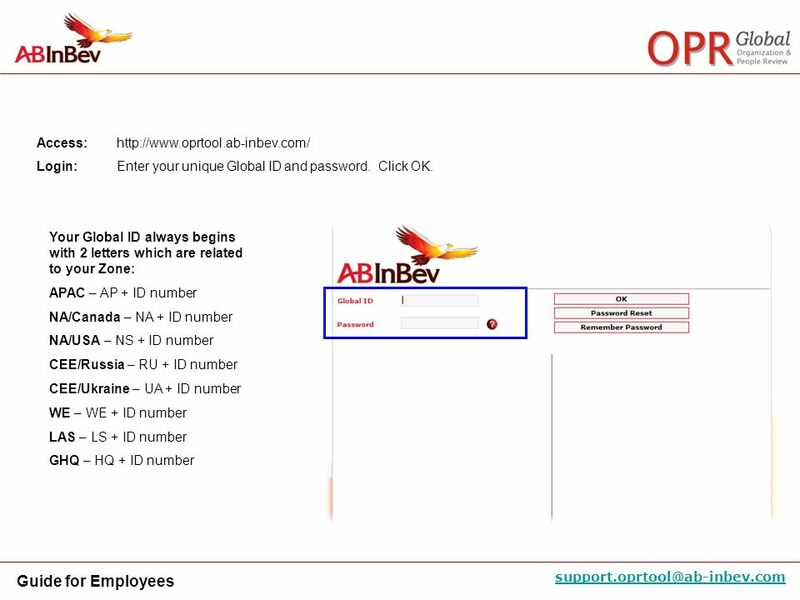 Include details about your key positions, responsibilities, and dates. 10 Remember to click Save when you are done! 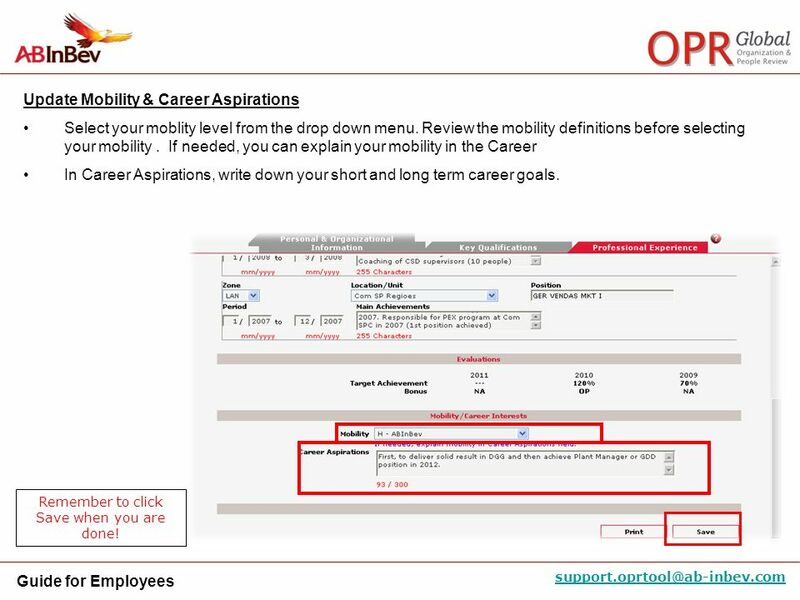 Update Mobility & Career Aspirations Select your moblity level from the drop down menu. Review the mobility definitions before selecting your mobility . If needed, you can explain your mobility in the Career In Career Aspirations, write down your short and long term career goals. Remember to click Save when you are done! Review the 180 instructions carefully. After each section, acknowledge you have read the instructions by selecting YES from the drop-down menu. Remember to click SAVE!!!! 13 Remember to click Save when you are done! Attention: At the bottom of the instructions, please indicate whether you have direct reports. 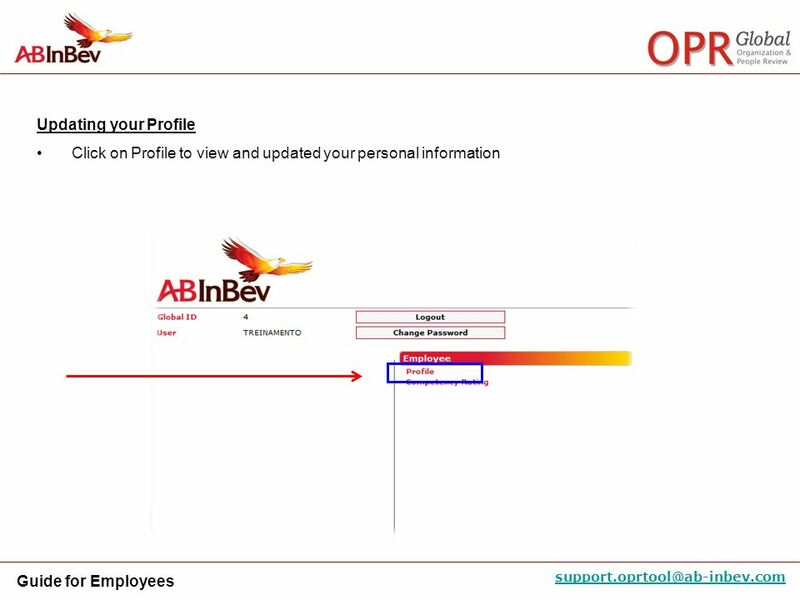 Direct reports include AB InBev employees who formally reports to you (full-line reporting to you). This does not include a project team, internal client or third party vendor. 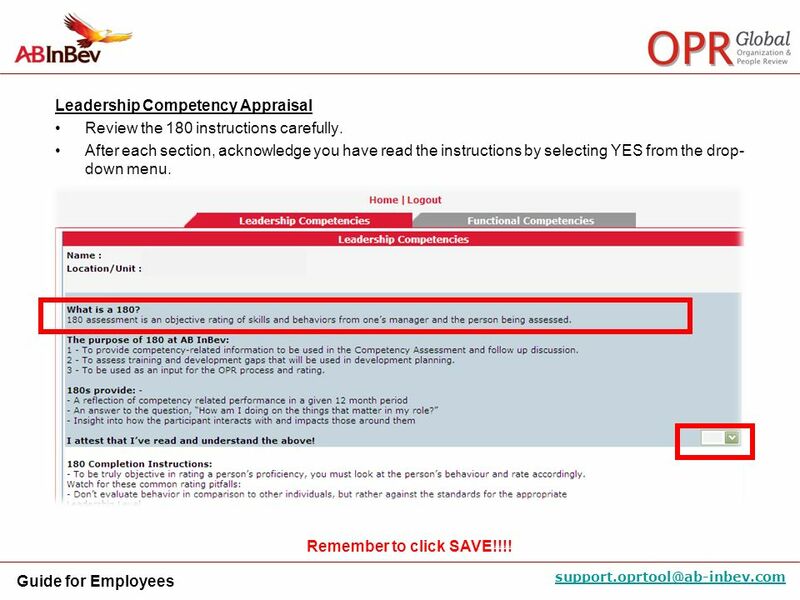 If you answer YES (you have direct reports): you will be asked to complete additional appraisal questions about your leadership. 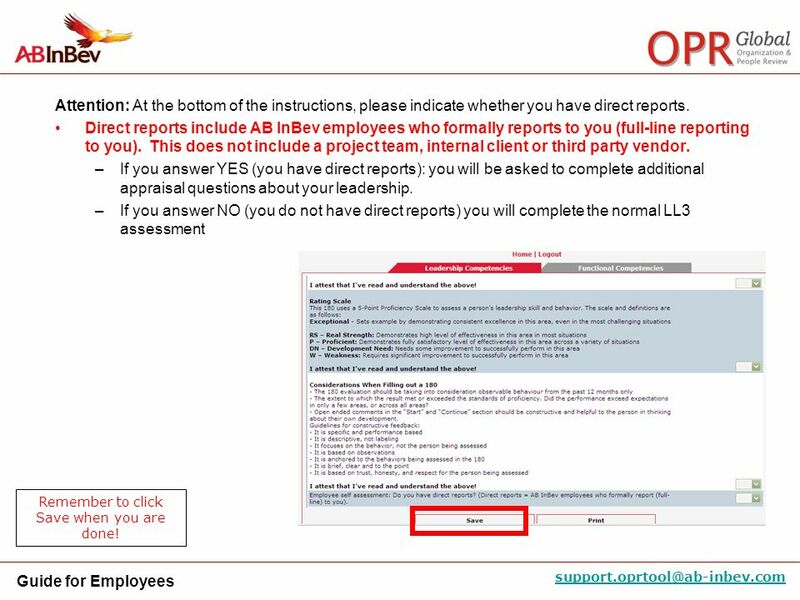 If you answer NO (you do not have direct reports) you will complete the normal LL3 assessment Remember to click Save when you are done! 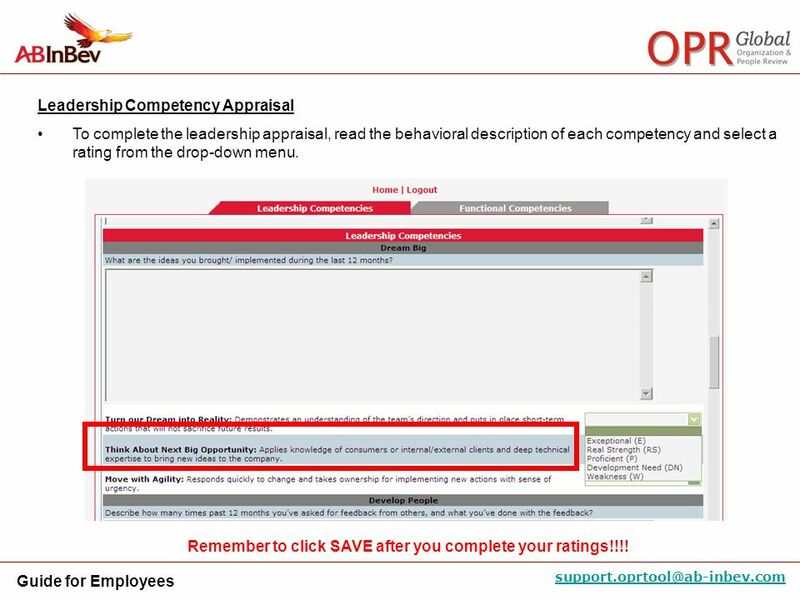 To complete the leadership appraisal, read the behavioral description of each competency and select a rating from the drop-down menu. Remember to click SAVE after you complete your ratings!!!! 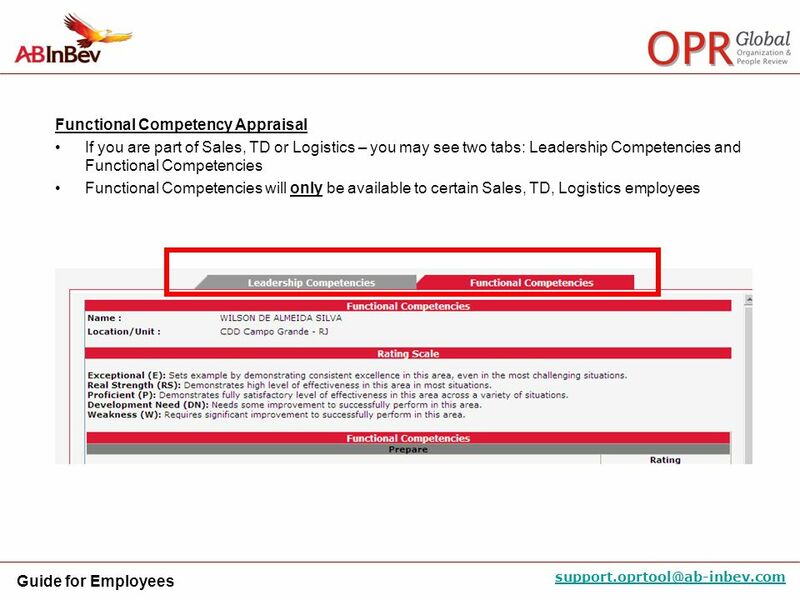 The functional appraisal is organized by master competency (e.g Design, Execute, Win). 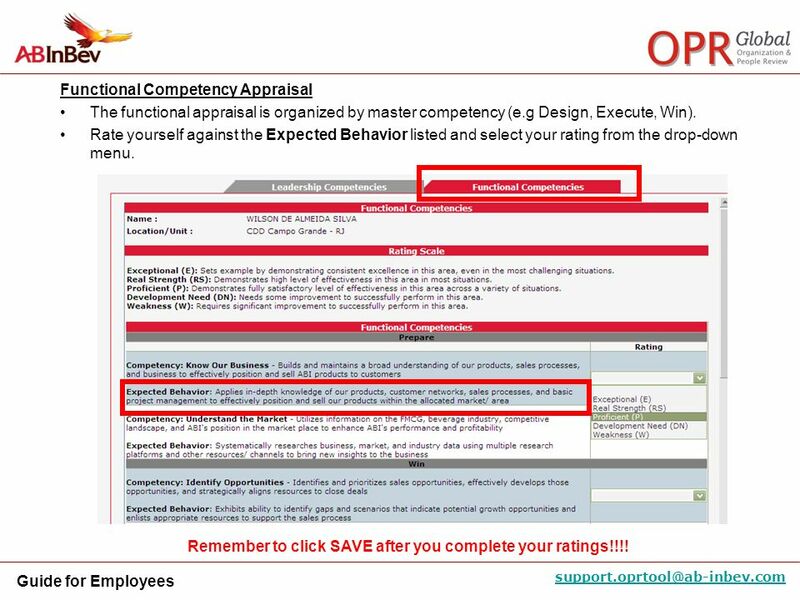 Rate yourself against the Expected Behavior listed and select your rating from the drop-down menu. Remember to click SAVE after you complete your ratings!!!! 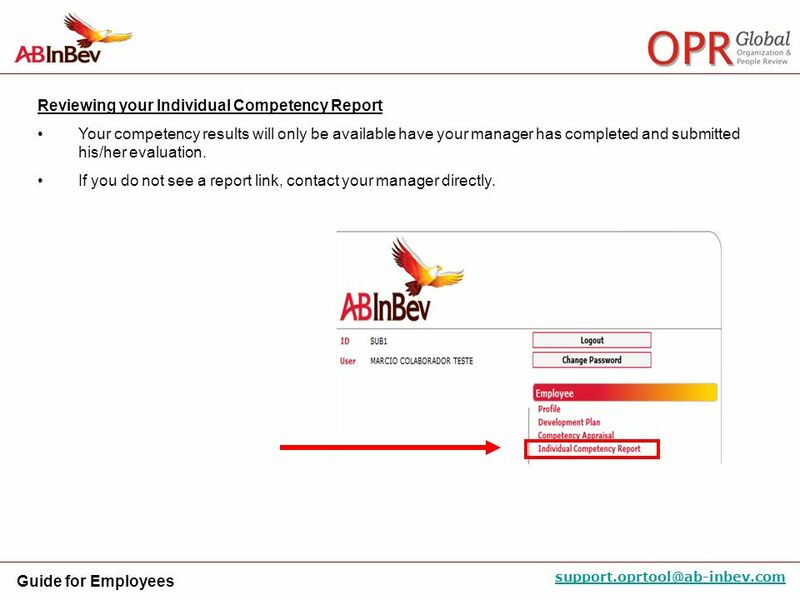 Your competency results will only be available have your manager has completed and submitted his/her evaluation. 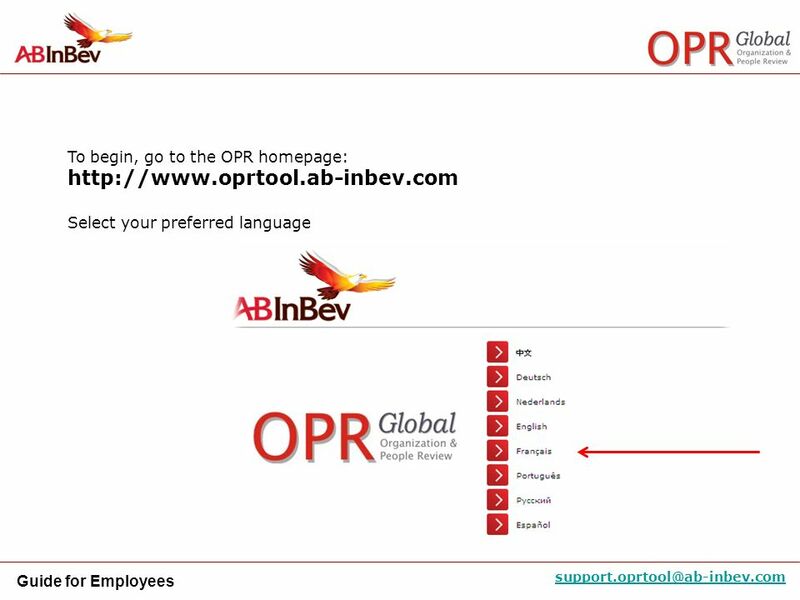 If you do not see a report link, contact your manager directly. 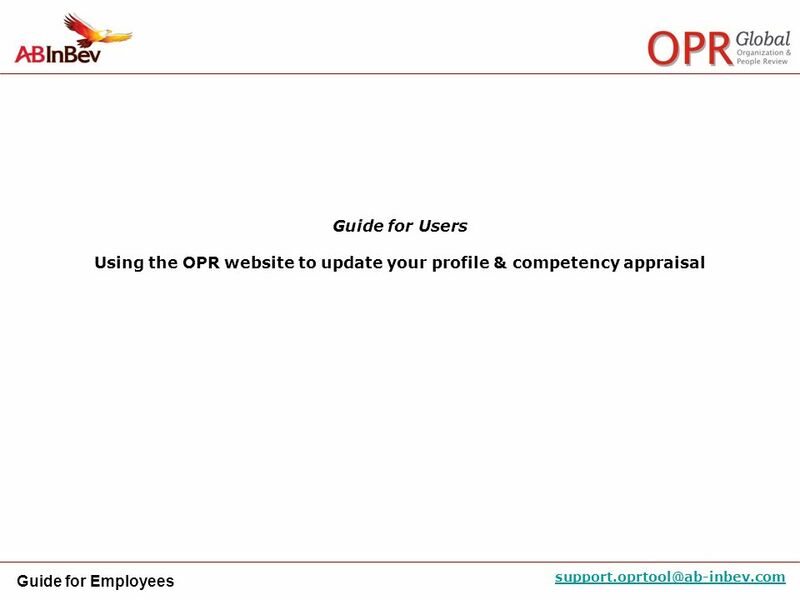 Download ppt "Using the OPR website to update your profile & competency appraisal"
Click on My Page to log in. Completing your personal details. February Introduction This Careers-based activity has been arranged for several reasons, namely… IT IS ALREADY TIME TO START THINKING ABOUT NEXT. Page 1 of 15 Welcome To the ETS – Crown Mineral Activity Road Allowance Online Training Course This module describes the process for initiating a CMA application. Graduate Admission System User Guide for Applicants 1 Last updated: April 2014. PGR Student Introduction to TurnitinUK OriginalityCheck Software Last updated January 2015. Ordering Textbooks Using the KIMRC On-Line Ordering System Reminder: The KIMRC is unable to purchase workbooks. EvalS Application User Guide version September 17, 2011. A student instruction guide to using. Why PASS-PORT? Speed User Friendly Cost Effective. Michele Weth Sharon Thompson Alma Diaz-Wu SUGAR LAND MIDDLE SCHOOL. 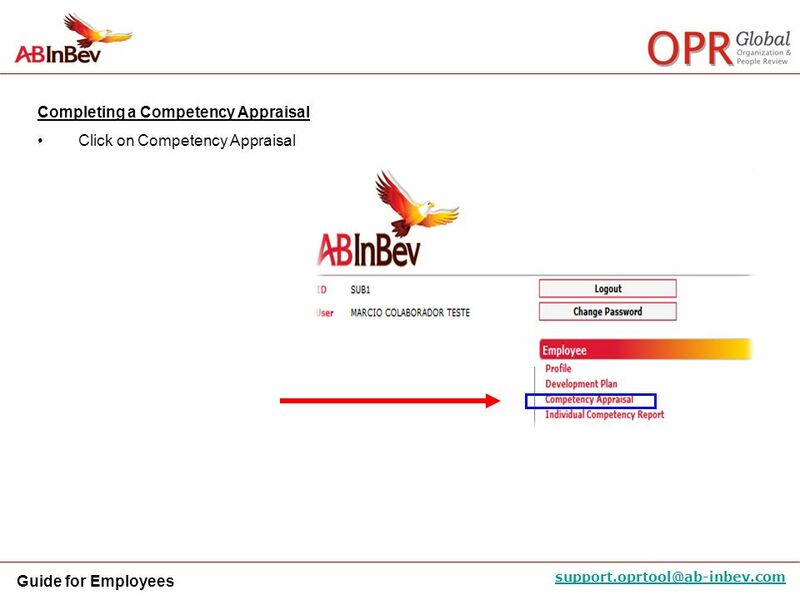 Create / Edit Competence Assessment Role: Employee.